February 1st, 1896. By the time the first of his three career-defining operas had its premiere, Giacomo Puccini was no longer living a life of impoverished artistic struggle. His previous opera, Manon Gascaut, had made his name in the world of Italian opera, and, more important, it had earned him a significant advance on his next work. With his debts repaid and a country villa acquired, Puccini was no longer a starving artist, but rather an up-and-coming star embraced by the artistic establishment. It was, perhaps, the perfect vantage point from which to create a work that so famously romanticizes the passionate struggles of the artistic class: La bohème, which was performed for the very first time on this day in 1896, at the Teatro Regio in Turin, Italy. From Murger's stories, Puccini drew his cast of characters: Colline, the philosopher; Rodolfo, the poet; Marcello, the painter; Schaunard, the musician; and Marcello and Rodolfo's respective love interests, the singer Musetta and the doomed seamstress Mimì. In choosing to write La bohème, Puccini was choosing to involve himself in his own real-life drama. Puccini's friend, the composer Ruggero Leoncavallo, was working on an opera of his own, also based on Scènes de la Vie de Bohème and also called La bohème. Puccini's pursuit of the project cost him his friendship with Leoncavallo, who is nevertheless famous for his 1892 opera Pagliacci, but whose own La bohème, completed one year after Puccini's, is now almost never performed. Puccini's La bohème, on the other hand, is second on the list of the world's most-performed operas, behind only his own Madama Butterfly, the third of his acknowledged masterworks (Tosca being the second). 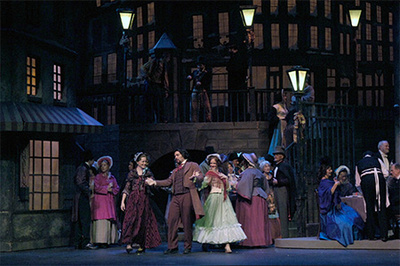 Even those who are not opera fans may be more familiar with La bohème than they realize; Puccini's opera acted as inspiration and source material for the late Jonathan Larson in creating the Broadway smash Rent.